The First Model Railroad Kits? LED, follow or get out of the way? Bad battery, bad! Good battery, good! Every wonder why the West Virginia state outline has the twin panhandle shape? You can find the answer as well as many other fascinating stories in Dan Toomey's book, "The War Came by Train, The Baltimore and Ohio Railroad in the Civil War." It is a highly readable and interesting account of the role the B&O had in the civil war. It is not a dry business history, but a living tale full of the characters and actions from the civil war. To say that the B&O was central to the civil war would be an understatement. 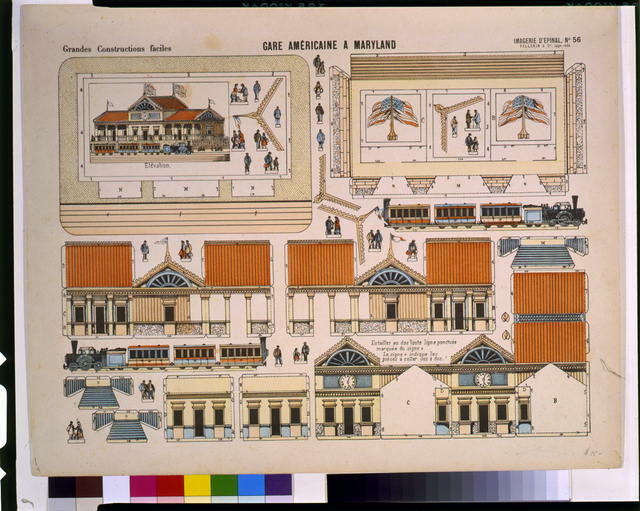 As the only railroad linking Washington, DC to the north through sometimes hostile territory, the B&O was vital to the Union. But it was also a trunk line linking the eastern seaboard with the Ohio River valley while passing through the coal mining region of Western Virginia. One of its main commodities was coal, and the B&O's fleet of iron coal pot hoppers figure prominently in the book. Of all the northern railroads, the B&O had the highest percentage of military traffic. It also suffered the most damage of any northern road. Robert E. Lee once said of destroying the bridges on the B&O in the Cheat River valley it would be, "worth to me an army." If you are a fan of the B&O, as I am, you will cringe as you read Dan's well researched telling of the damage and depredations the Southern armies and bandits inflicted on the railroad. The damage that Jackson and the rebels inflicted on the B&O, including plain old train robbery, went a long way to ensuring that the state of Maryland remained staunchly in the Union. In spite of constant raids and damage, the railroad was able to quickly repair itself and continue to conduct business, albeit with some prolonged gaps in service due to rebel occupation. Dan does a good job of chronicling these raids and keeping them in the overall context. Dan's story starts with the John Brown raid. Did you know Robert E. Lee and Jeb Staurt rode the B&O on a light engine from Washington to Harper's Ferry to take command of the federal response to Brown's raid. He progresses through the war to the funeral train that took assassinated President Lincoln home to Springfield through Baltimore. The final chapters on the post-war B&O's efforts to recover propety stolen during the war and the B&O's role in the veteran reunions that took place up until 1938. Dan also also has fascinating chapters on the role the B&O had in West Virginia's statehood, and in the troop transfer for the Chattanooga Campaign. All in all a great book. If you are a B&O fan, this is a must read. Others will find the book useful as the B&O was at the center of most of the war's critical campaigns including Antietam, and Gettysburg. But be careful, after you read this book, you might find yourself wanting to build a railroad depicting the B&O. I know I am. not the USMRR Washington, which was an 0-8-0. High resolution version available here. Identifying the service record of the Baldwin 256, an 0-8-0 engine in USMRR service as Washington, was difficult as the data conflicted and was incomplete, and there was at least one typo in a source. To complicate matters, there were three engines with that name in USMRR service. This research indicates that the first engine to traverse the famous beanpole and cornstalk engine bridge was the USMRR Washington. I sent Rich Hochadel a note with a question about the the engine Washington's entry in the USMRR Roster that he authored. Rich said that there were three engines with the name Washington in service and the data is contradictory. Here is a note from Rich on how he arrived at his conclusions. I've spent the morning and half the afternoon going through the research I used for the USMRR roster, seeing how I sorted the info on the three different Washington's in the Department of Virginia. A Russell photo of unknown-B in Alexandria in 1863. Can anyone identify the builder? Going through the sources and notes provided by the R&LHS, I found that one person's roster had the Unknown-B as "captured at Fredericksburg Summer 1862," and another had Baldwin-256 as "Abandoned at Fredericksburg 1862." An undated "Statement of Locomotive Engines and Cars" provided by the R&LHS lists a Washington, costing $4500 (which would indicate Baldwin-258) lost "at Fredericksburg, under Gen'l Burnside," which would mean late 1862. 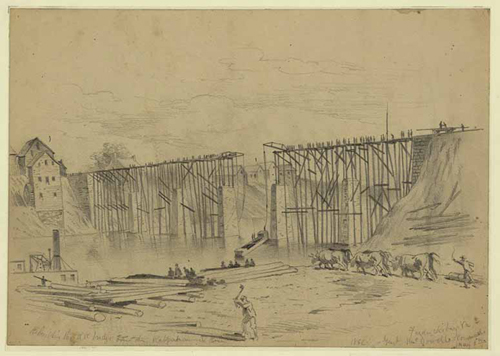 However, in his Memoirs Haupt quotes a telegram he sent to McDowell on May 14, 1863, concerning the new bridge over Potomac Creek, “I propose, as soon as I can get track timbers down and track closed, to pull over the engine Washington, by means of ropes. It if goes into the creek, it will cease to trouble us for awhile...” Since we know Haupt was disparaging Baldwin-256 in May of 1863, it must have been Unknown-B lost at Fredericksburg. The fact that there is no mention of the engine in official records after early May of 1862 also argues the same case, though it makes late 1862 seem less likely. The discrepancy in the "Statement" must be a clerical error, confusing Unknown-B, which was apparently never on the official roster, with Baldwin-256 when listing engines lost in action. And I have no idea where I got the December 1962 date in my roster. As for documents at the National Archives. Engine book from Oct 1862 to Feb 1863 (#10 on cover) (Memphis? This is an excerpt from Haupt's Reminiscences (page 48) that mentions the engine Washington. Apparently it was not the best engine as Haupt didn't seem to mind if it fell in the river while testing the bridge. The following telegram to General McDowell from Potomac Creek, May 14, 1863, reports some difficulties: There are so few men here able or willing to climb about on the high trestles, that I fear the work of bracing will be extremely tedious. Out of twelve men selected to spike poles on top of bents, only one made his appearance. I must therefore resort to new expedients. I propose, as soon as I can get track timbers down and track closed, to pull over the engine, Washington, by means of ropes. If it goes into the creek, it will cease to trouble us for awhile ; if it reaches the other side, it will have a good road and may keep the track. We can readily get cars over by planking between the tracks and pushing. The rain gives us much trouble, but I will spare no effort to get an engine to the Rappahannock by Saturday (17). Men are wet, dull and no life or activity in them. With all these difficulties, the bridge was finished in ample time, as the army did not move until May 26, and then it was a retrograde and not an advance movement. The date on the telegram as quoted in Haupt's book has to be a typo as this incident happened in 1862, not 1863. If so, that helps corroborate that Baldwin 256 was the Washington in question. It must have abandoned in Fredericksburg on August 31, 1862. Here is a New York Times article with details of the evacuation of the Aquia line. Though full of interesting detail and somewhat biased reporting, it does not mention abandoning the engine. But since the Union had repair shops at Fredericksburg, it is possible it was left there. Destruction of the Bridges, & The March to Aquia Creek. Safety of the Whole Command and its Materiel. FREDERICKSBURGH, Va., Sunday, Aug. 31, 1862. continued during the fore part of the day, admonishes us that the Fall rains will soon be upon us, and with them that there will be an end to all effective use of Virginia roads. Narrow, steep, crooked, sticky and stony, one day's hard, rain is sufficient to render them almost impassable for wagons and artillery. The necessity of locking wheels while going down steep places, scoops outdeep holes in the roads, which soon become reservoirs of water, and grow into gullies and holes, which test the skill of drivers and the strength of the best army-wagons to pass safely through. To-day the roads are simply execrable, and two days more of rain would more effectually out off our "retrograde movement," than the most effective rebel force in the rear. Under the orders of the War Department, Gen. BURNSIDE might have vacated this place a week ago; but reluctant to abandon a position which has been so long held, and which has been deemed of so great strategetical importance -- and which might still become so -- he has moved with great deliberation, and has finally consented to fall back in strict conformity to orders -- not on account of the threatening attitude of the enemy's forces. Meantime all the regimental baggage, material of war and army stores have been carefully sent away, and are saved. It is the first apparent retrograde movement of Gen. BURNSIDE, but I do not believe he regards it as in any sense a retreat. The motives of it, if I knew them, I would not be at liberty to reveal. Suffice it to say Fredericksburgh has been abandoned; the three bridges, which were constructed for connecting the two banks of the river for our own use, have been destroyed; the railroad buildings on the Falmouth side, including the offices of Post-Commissary and Quartermaster, with a small amount of stores only, have been consumed by fire; the machine-shop and foundry in the town of Fredericksburgh, formerly used to so good advantage by the rebels, but more recently occupied as a repairing shop for our engines and railroad, has been blown up, and the large bakery establishment at Falmouth has also been burned. So far as this position is concerned it is now being converted into a "howling wilderness" for the occupation of the rebel army, now soon to return, no doubt, to the place. The citizens of the town were surprised while on their way to church in the afternoon, by dense volumes of smoke arising over our encampment. In fact, I was surprised myself, and received the fact as a gentle token that I had better pay my livery stable and board bill, and transfer my interests to the northern bank of the Rappahanuock. On looking about me, I found an unusual commotion once more among the people of African descent in the town, and a decided tendency of the tide of emigration toward the wire bridge, which runs from the foot of Williamstreet. Knots of Secessionists congregate at the corners of the street, but particularly opposite the bridges, to witness the exodus of the white as well as the black population. Several Union families, who have recently been watched and threatened, took the hint, and packed up. Ladies, dressed in their Sunday-go-to-meeting, looked out of their windows, or congregated on the hill-tops, to see the Yankees go out, and Stonewall Jackson come in. After so long and grievous a suspense, and hopes deferred, who could grudge them this hour of elysium. I met on the bridge pioneers with axes, arid barrels of tar which they were industriously plastering along the walk, to render the structure the more inflammable. There were also piles of chips and rubbish deposited in the wooden frame-work which crowned the different stone abutments and sustained the wire cables which held up the bridge. In a few minutes more the torch would be applied, and -- a handsome bonfire to light the pious rebels the way to church. As yet, however, the Provost Guard occupied the town, and the Eighth Connecticut were on picket duty, ten miles on the way to Richmond, scattered along the bowling green, the plank and telegraph roads. On reaching headquarters, at the Lacey House, I sound all the [???] had been struck; the ambulance and army wagons were hitched up; officers' horses were all saddled for a start, and everything [???] a decided movement. Infantry regiments stood in line upon the wide plain fronting headquarters; long lines of wagons and artillery occupied the main road, and calvary men [???] in their saddles ready for the word "march." in the midst of this serve the commanding General wax observed walking leisurely to and fro, dispatching orders to the different regiments, and watching in calm silence the movements of the various commands. It was indeed an hour of deep interest and concern to him. For days and nights he has watched with sleepless vigilance every movement of our own and the enemy's forces, as they affected his own position, and something of weariness could be detected in his usual elastic step. At this juncture a poor woman with three lovely children clinging to her side came up the hill and passed through the gate, bringing each of them some [???] article of household furniture. The quick eye of the General immediately recognized her as un excellent Union lady, of Fredericksburgh, who was escaping with her children and little effects from the town. "Have you anything else down at the bridge, Madam?" asked the General. "Only a bed and a few smail articles, Sir," she timidly answered. "Send down an ambulance, wagon-master, and have them brought up and carried to the depot," was the General's orders, and it was done, in a few minutes the poor widow had the pleasure of seeing all her remaining goods safely deposited on the cars for Aquia Creek. Meantime, all other arrangements having been completed, a mounted orderly was sent to the point to order the Eighth Connecticut, on picket duty, to retire. Col. HARLAN accordingly ordered his men to fall in, and they immediately fell back on the town. When they reached the river, the railroad and wire bridges were already on fire, and they went down and crossed on the only remaining bridge -- that constructed of canalboats -- at the lower part of the town. The Provost Guard had already been ordered to vacate the town. Shortly after 5 o'clock P.M. the torch was applied to the railroad station, which was already well consumed before the bridges were fired. Shortly before this was done, the Sixth New-York Cavalry came in from the direction of Barnett's Ford, and reported that an ambulance and wagon train which overtook them on the road was hurrying [???] with great speed, and reported that the rebels in considerable force were behind them, having crossed just above, and were pressing on their rear. General BURNSIDE and Staff were the rest to leave the ground, after seeing, everything [???] off, and proceeding along the [???]. The railroad train was filled with people, white and black, with their household goods, receive to [??? ], employees of the Aquia Creek Railroad, that they [???] engaged, night and day, for a seek just, [???] goods and [???] to and no [???] no hour of the night [??? ].Their kindness and considerate treatment of the poor contraband exiles, with their cart-loads of duds, also entitle them to the gratitude of the good everywhere. I regret that I do not know their names, to mention them in this place. The march from the river to Aquia Creek was very difficult, and occupied the whole night. The roads, flooded by the morning rains, and cut up by incessant travel of animals, vehicles and cannon, were almost impassable in some places. Gen. BURNSIDE kept along with the train, and seemed always in the place where there was the most difficulty. On several occasions he dismounted, and standing leg deep in mud, put his shoulder to the wheels, and called on the men to imitate his example, in order to extricate the ambulances and wagons from deep holes in which they had become stalled. One ambulance was upset near Station No. 9, and three or four persons who were in it narrowly escaped being killed. One or two other teams were disabled by the breaking of axles or [??? ], but nothing of a serious character occurred on the road. By daylight nearly the whole of the immense train was safely through the hills, and encamped within sight of the landing. Without waiting for sleep, an hour of which he has scarcely experienced for forty-eight hours, Gen. BURNSIDE rode up to the hillsides overlooking the place, and selected positions where batteries were planted to enfilade the approach to the landing. As an additional protection, four gunboats He atanchor within easy shot of the roads which must bepassed in approaching the position. Gen. BURNSIDE's Division is all right. Further this deponent saith not. are still on their temporary bases. Is this a post about fences? With a vey rainy weekend, it was time to do some scenery at Brooke. I finally painted the last section of backdrop. This area is mostly a bare hill dominated by Redoubt Number 2. That completes all the backdrops, though I may have some touch up to do in Aquia when I get there. The deep scene is nice, but the problem with deep scenes is that they are....deep. 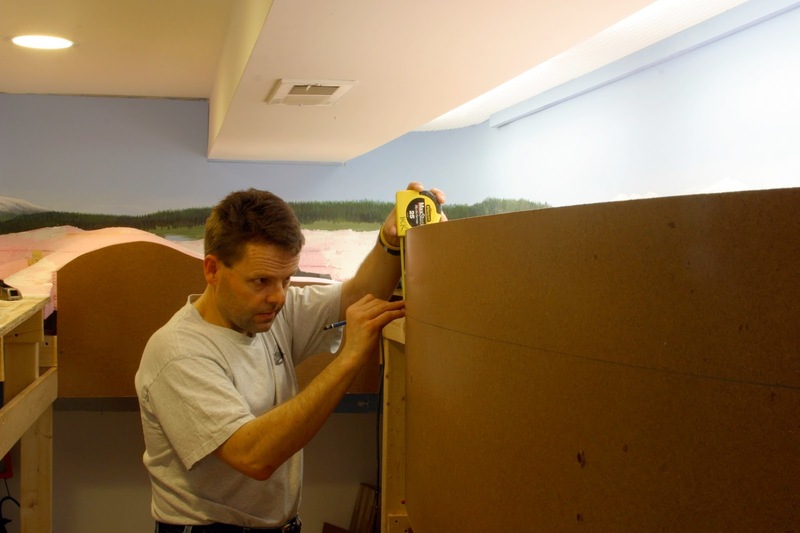 It was very difficult to paint on the wall as the scene is very far back and hard to access. I knew this was coming, perhaps thats why I put it off so long. But it came out nice in the end. I decided to add a copse of trees where the backdrop bumps out to avoid a plumbing pipe. The trees help soften the visual impact of the protrusion. I used Supertree twigs attached to small sticks for trunks. I wanted the trees in this area to be smaller for some forced perspective so I didn't make wire armature trees. Fences run all along the main line from Accokeek to Broke. One of the key scenic features in this area are the fences. Since the terrain is mostly open, the fences add a nice detail. The story is that the Union has a large herd of beeves here. So they installed or repaired the existing fences to make sure the cattle stay put. There is about 36 feet (actual) of fence so far, with plans for abut 10 more feet. I have a pack of Woodland scenics cows, but I probably could use more. This is a brief video showing the back-in-action Fury hauling a train load of empties north to Aquia Landing. It features the completed sections of the layout. I swapped out the battery on Fury tonight. It was rather trivial, as the battery simply unplugs from the Battery Power Supply (BPS). I installed a new battery, reconnected the wires from tender to engine and she was back in operation. I plan to get rid of the plugs and hot wire the tender and the engine. The plugs are a pain, especially if one has to man-handle the loco at all (more about that later). While I was at it, I trimmed the wood pile a bit. It now does not completely hide the electronics, there are a few view angles where they can be seen. But from most angles the smaller wood pile looks better. Paul was over last week taking photos of Fury and Whiton for an article about battery power for MR. His article will survey some of the new systems available by using Steve Sherril's and my layout as case studies. Steve uses the Del Tang system. It is incredibly tiny. If you have a small engine that you would like to add battery power, that system might be the answer. The video by Joey Ricard describes Steve's system. A few months ago Dave Schneider, the owner of SMR Trains, announced they were taking reservations on their latest engine, a Baldwin 0-8-0 Flexible Beam locomotive. While I found the idea of a flexible beam engine interesting, I thought it would not be appropriate for my layout, especially given the tight radius curves on my layout. As I read SMR Trains advertisement a second time in more detail, I discovered that Dave intends the model to have a functioning flexible beam drive train. The mechanical geek in me could not resist and I ordered one, the USMRR Washington. If the flexible beam works, maybe it will handle my layout's curves. Cross section showing the flexible beam on the front two drivers. Next I decided to research where the locos operated to see how much of a foobie I would have by operating it on my layout. Richard Hochadel compiled a detailed roster of USMRR engines that is available on the ACWRRHS Yahoo Group site. He shows that Baldwin built engine 256 as an 0-8-0 in May 1846 as “Washington” for the Philadelphia & Reading RR. The USMRR purchased it in October 17, 1862 for $4500, to become USMRR Dept. of Virginia #63/ “Washington.” This was the second Washington on the USMRR, as there were a total of three engines with that name. The USMRR used this engine on the Orange & Alexandria RR and the Richmond, Fredericksburg & Potomac RR through December 15, 1862 when they abandoned it at Fredericksburg. The Confederates captured it and sold it on March 31, 1863 to the Richmond & Petersburg RR. The United States recovered in in April 1864 on the Petersburg RR and sold to the Baltimore &Ohio RR for $1,700, in October,1865 becoming #534 on the Central Ohio. It was dropped from the roster in 1884. If the narrative is correct then the purchase and abandonment dates do not seem right to me. It must have been purchased earlier in 1862 and abandoned when Burnside ordered the destruction of the Aquia line during the Antietam Campaign, sometime in October, 1862. The USMRR rebuilt the Aquia line starting on 17 November. It was ready in about 10 days time. The Aquia train log I have shows the USMRR Aquia line in operation in early December. I think it unlikely they would have abandoned an engine in December when they were operating the line. Also, the Confederates were running trains to Fredericksburg at this time. So, it ran on my railroad, but the (suspicious) dates indicate a few months before I model. Not much a foobie at all. What is a flexible beam engine? 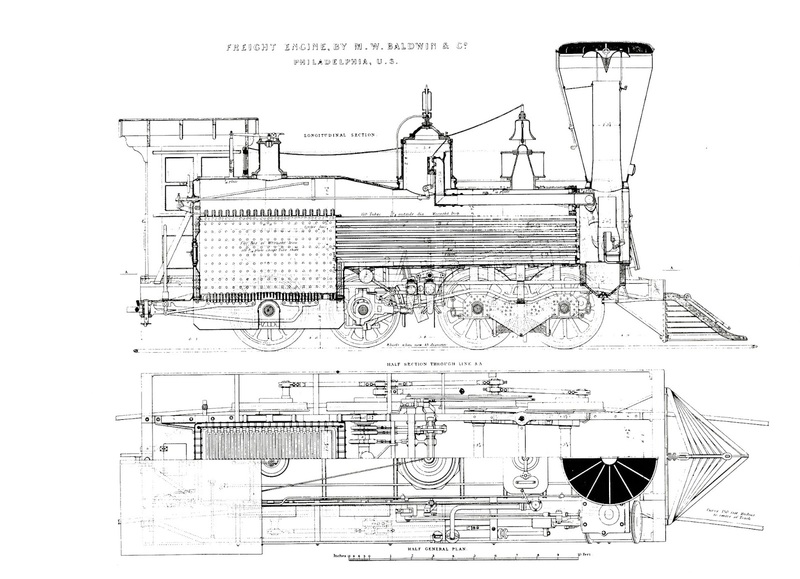 Baldwin developed it to allow his 6 and 8 coupled engines to negotiate tight curves found on American railroads. European locomotives had rigid 6 and 8 coupled engines, but they did not ask these engines to traverse tight curves. 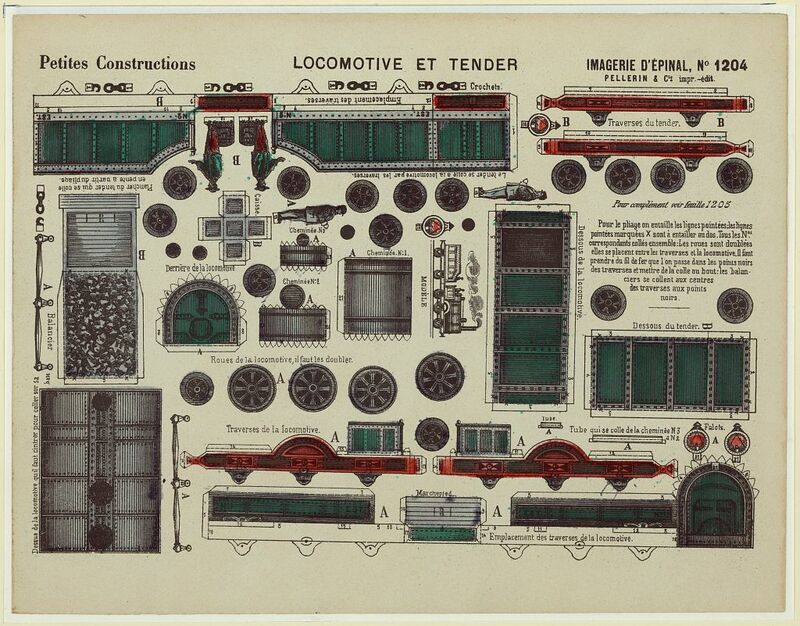 Here is a more detailed explanation from "The Illustrated Catalog of Locomotives." Its principal characteristic features are now matters of history, but they deserve here a brief mention. The engine was on six wheels, all connected as drivers. The rear wheels were placed rigidly in the frames, usually behind the fire-box, with inside bearings. The cylinders were inclined, and with outside connections. The four remaining wheels had inside journals running in boxes held by two wide and deep wrought-iron beams, one on each side. These beams were unconnected, and entirely independent of each other. The pedestals formed in them were bored out cylindrically, and into them cylindrical boxes, as patented by him in 1835, were fitted. The engine-frame on each side was directly over the beam, and a spherical pin, running down from the frame, bore in a socket in the beam midway between the two axles. It will thus be seen that each side-beam independently could turn horizontally or vertically under the spherical pin, and the cylindrical boxes could also turn in the pedestals. Hence, in passing a curve, the middle pair of drivers could move laterally in one direction—say to the right—while the front pair could move in the opposite direction, or to the left; the two axles all the while remaining parallel to each other and to the rear driving-axle. The operation of these beams was, therefore, like that of the parallel-ruler. On a straight line the two beams and the two axles formed a rectangle; on curves, a parallelogram, the angles varying with the degree of curvature. The coupling-rods were made with cylindrical brasses, thus forming ball-and-socket joints, to enable them to accommodate themselves to the lateral movements of the wheels. "Geometrically, no doubt, this combination of wheels could only work properly around curves by a lengthening and shortening of the rods which served to couple the principal pair of driving-wheels with the hind truck-wheels. But if the coupling-rods from the principal pair of driving-wheels be five feet long, and if the beams of the truck-frame be four feet long (the radius of curve described by the axle-boxes around the spherical side bearings being two feet), then the total corresponding lengthening of the coupling-rods, in order to allow the hind truck-wheels to move one inch to one side, and the front wheels of the truck one inch to the other side of their normal position on a straight line, would be √602+12 - 60 + 24 - √242-12 = 0.0275 inch, or less than one thirty-second of an inch. And if only one pair of driving-wheels were thus coupled with a four-wheeled truck, the total wheel-base being nine feet, the motion permitted by this slight elongation of the coupling-rods (an elongation provided for by a trifling slackness in the brasses) would enable three pairs of wheels to stand without binding in a curve of only one hundred feet radius." I made this animated gif to illustrate the action of the special truck. The Baldwin flexible beam engines were designed to burn coal. Did it burn coal on the USMRR? Maybe. The USMRR did have some coal burning engines. For example, this excerpt from a letter from Devereaux to Haupt in 1862 describes some coal burning engines obtained from the B&O and used on the USMRR Manassas Gap line. We have only one coal light engine, never used for freight. On Monday week, Col. McCallum seized from Baltimore & Ohio Road three heavy coal burners for the special purpose of aiding me in sending forward Ord's Division. They were on the road when you came, but had done the duty they were procured for and I still kept them, and to meet the demands that might occur by keeping them, I ordered coal. This was last week. The engines did not get out of coal till yesterday, Monday. Note the Coal Burner 70 was a B&O Winans 0-8-0 Camel built in 1851. Did the Washington burn coal when on the RF&P? I have not found any evidence that it did, but I am not ruling it out. Perhaps more research will find out. 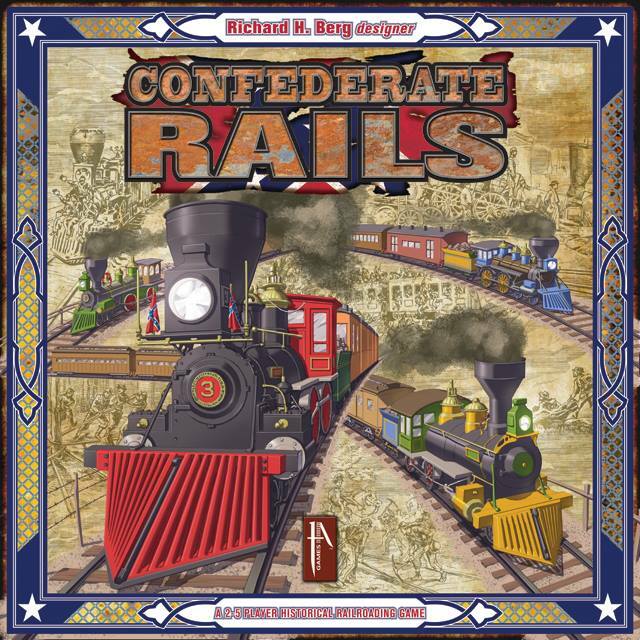 Back around 2001 well known game designer Richard Berg developed a board game called Confederate Rails. It is a brilliant depiction of the roles southern railroads had in the civil war. It is not a war game per se. It is more a railroad game, but with a twist. Players represent the owners of the various Confederate railroad companies. Each player owns a selection of railroads that can be either bought at the start of the game through a bidding process or distributed randomly. The object of the players is to make money by delivering loads of cargo, passengers and troops, ostensibly in support of the war utilizing your own lines, or lines of others for a fee. 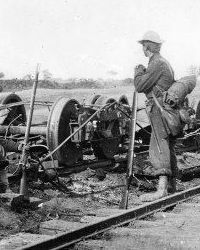 Unlike most rail games where you build your railroad network, in Confederate Rails, your existing network at the start of the game shrinks as the war goes on. The progress of the war is represented by die rolls on an historical outcome table resulting in a random, but inexorable constriction of the Confederacy as the Union closes in. A series of event cards changes the flow of the game and can add unexpected turns, but in the end the Union wins the war. For the players it is just a matter of when and which railroads made the most money. The player with the most money wins. Of course the victory is pyrrhic as the money is in Confederate dollars, worthless once the war ends, but that never stopped capitalists before. I find the concept of the game brilliant as it really captures the attitude that many of the southern railroad companies maintained throughout the war. To learn more about how Southern railroads affected the war effort see Robert Black's "Railroads of the Confederacy," and Angus Johnson's, "Virginia Railroads in the Civil War." Game designer Berg credits Black's book with much of his inspiration for the game. US Marine Corps officer Ian Pollit did a Master's thesis in 2002 on how Confederate railroad policy hurt their war effort. You can download it free from the Defense Technical Library here. In addition to being an abstract, but realistic depiction of southern railroad operations during the war, the game is a lot of fun to play. The new game company, 1A Games, is planning on reintroducing the game with higher end components and box. They have a Kickstarter site for the game. The Kickstarter site is not yet active. They are looking for feedback from potential buyers on what they would like to see. 1A games have asked me to consult on some of the development aspects. My main contribution has been this poster. It will be used as one of the Kickstarter rewards for people that sign up. 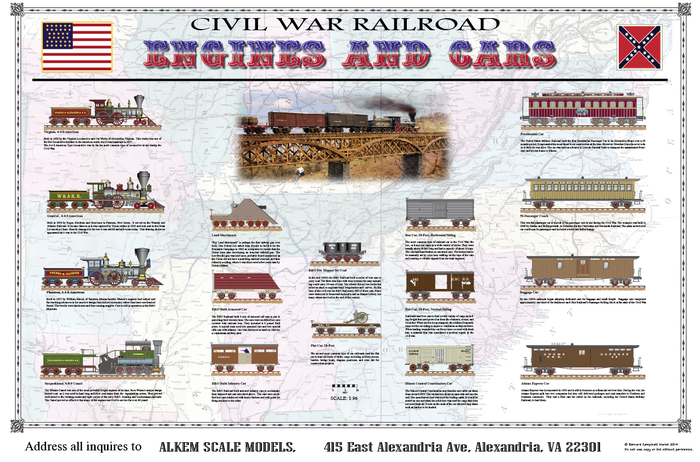 The poster shows an assortment of typical civil war engines and cars along with some comments. The poster will be about 36x24 inches. In the final print form the engines and cars are in 1/96th scale. If you like games and civil war railroads, this is the game for you. A draft copy of the poster. site of Falmouth on the layout now. Several years ago, before I was building the O scale layout, I installed some inexpensive shop lights and low profile under-cabinet lights to illuminate the layout. The layout has changed a couple times, but the lights have remained. In fact I have added more. But, most of these have failed at one time or another. This week I replaced four more. Replacing the under cabinet lights isn't too hard. The shops lights are more difficult as they are over parts of the layout with deeper bench work. I am phasing them out with smaller fixtures so they are easier to replace. I am seriously considering removing all the fluorescent lights and going with the LED strips like we used on McCook's Landing. While I was in the layout room I fired up the locos and ran some trains. It was gratifying to see everything run without problem. Even the DCC locos ran great, an impressive achievement as I hadn't cleaned the track in about a half a year. I have noticed that every winter the wood contracts in the layout room. Some of the turnout stub switches get tight. But tonight that wasn't a problem. Actually, not everything ran great. The battery in the engine Fury is not charging. I knew that before I started so I didn't try running it. A few months ago I sent it out for inspection and they said it checked out fine. But now it won't take a charge. I suspect the battery is bad. I have replacement batteries, so replacing its battery is now on the do list. I am itching to get working on the layout, but I have backlog of custom models to build for clients. I was recently doing some research on 19th Century lithographs and broadside posters. I came across these images at the Library of Congress. They date from 1870-1900 according to the LoC. 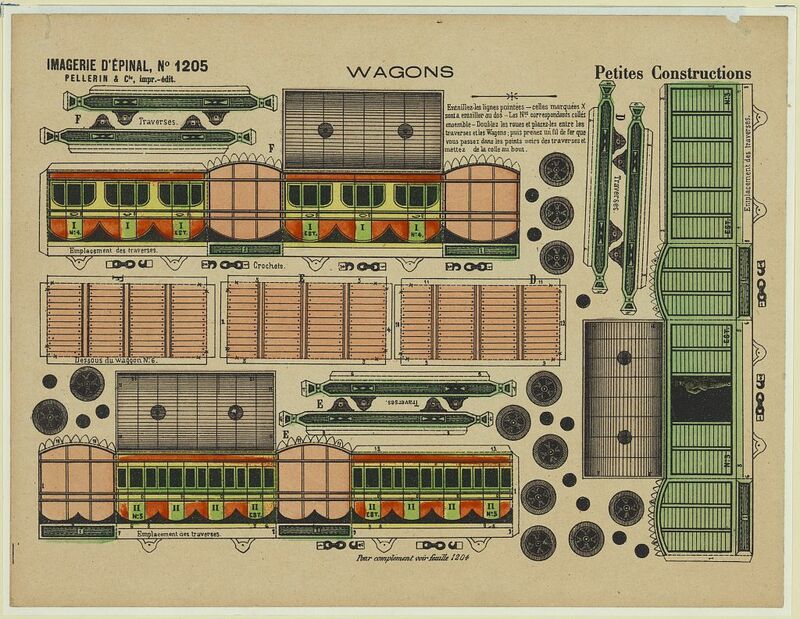 They are prints designed for creation of paper models of a locomotive, coal car and a station. Could these be the first model railroad kits ever? Anyone care to try making one of these? Just print, cut and assemble. Here is the direct link if you wish to see the original scans. As I wrapped up "The Model Railroad Goes to War," I thought I mention and briefly review some books I found interesting and worth reading during my research. I mentioned "Engines of War" by Christian Wolmar in an earlier review. Then I just discussed the chapters on the American Civil War. But Wolmar's book goes well beyond that with a special emphasis on the railroads of the English colonial wars such as the Sudan and Boer war. Overall I enjoyed the book very much. His discussion of the German railroads in WWII was particularly interesting to me. I heartily recommend this book. Speaking of WWII, Alfred Mierzejewski's "Collapse of the German War Economy, 1944-1945" is a very interesting book in spite of its dry sounding title. It is a rare combination of economic analysis and military history that provides new perspectives on the German war economy and Allied air intelligence. He describes how the German economy collapsed under Allied bombing in the last year of World War II. He discusses how Allied strategic bombing campaign evolved and how it affected German industry. He discusses the German reactions as well as the Allied decision making. There is no detailed discussion of air bombardment tactics or missions. Nonetheless, he covers many topics of interest including railroads, coal hauling, intelligence collection, Ultra secrets, photo reconnaissance, and bureaucratic infighting (both Allied and German.) He comes to the conclusion that the railroad marshaling yards (a term he uses, we model railroaders would more likely call them classification yards), particularly for coal hauling, were the most critical part of German industrial infrastructure. Once the Allies began targeting them systematically, German industry ground to a halt. In reading the book I couldn't help but think about modern air campaigns and their effectiveness. But I also thought back to how railroads behaved in the Civil War, especially the descriptions in Agnus Johnson's book on "Virginia Railroads in the Civil War" of how railroad profiteering hurt the confederate war effort, and Cameron's corrupt behavior while Secretary of War as described in the first couple chapters of Taylor's "Victory Rode the Rails." Transportation Number," a book I found very helpful in researching the WWI chapters of my book. 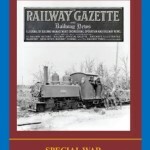 In 1920, The British Railway Gazette published a special edition to record transport used in the war. This would have been the first time that most readers would have become aware of the machines and techniques used to achieve the recent victory – much of it had been secret until then. Since 1920, copies of this special edition have been highly prized collectors’ items. As part of the events to mark the centenary of the conflict, the Moseley Railway Trust has worked with Railway Gazette International to re-print the 1920 special edition. This book is chocked full of historical information and operational data on British railways in WWI. You can find more information about it here.